Congratulations Earhart student! The Parade Company brings winning student’s design to life during 23rd Annual Skillman Foundation Float Design Contest. 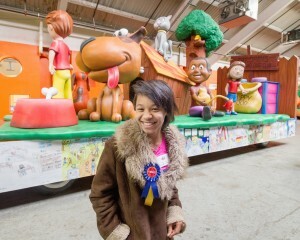 DETROIT (November 19, 2014) –Eighth grade student Naomi West of Earhart Elementary-Middle School in Detroit saw her artistic creation brought to life for the first time today at The Parade Company when she was announced as the 23rd Annual Skillman Foundation Float Design Contest winner. West’s drawing entitled “Children’s Pet Cuddle & Care Club” was transformed into a magnificent float which features a giant bobble head dog sitting five feet in diameter with a dog bowl large enough to hold up to 20 gallons of water. The 30 foot long float also boasts a bag of puppy food which can hold 30 regular-sized bags of dog food. The float features an 80-foot wrap which incorporates the 2014 Honorable Mention winning designs along with other entry favorites. West, who was the runner up winner in the 2013 Skillman Foundation Float Design Contest, will be joined by her family as she accompanies her float along the parade route during America’s Thanksgiving Parade® presented by Art Van. The artists, their families, teachers and principals attended the unveiling. Six honorable mention winners were selected and invited to see their drawings on display. The students include: Daniela Castro (7th grade student, Clippert Academy) for her work “Dream Neighborhood”, Charles Hickman Jr. (7th grade student, Bates Academy) for his work “Soul Food City”, Salena Johnson (8th grade student, Henry Ford Academy for Creative Studies) for her work “Build Up Detroit”, Laura Vance (8th grade student, Henry Ford Academy for Creative Studies) for her work “Big Top Circus” and Moriah Young (4th grade student, Southwest Detroit Lighthouse Academy) for her work “Bird World”. Representatives from The Parade Company and The Skillman Foundation joined the students for this special occasion. Founded in 1984, The Parade Company is a not-for-profit organization governed by the Michigan Thanksgiving Parade Foundation whose board of directors is comprised of key civic and corporate leaders in the greater Detroit region. The Parade Company is celebrating 88 years of Parade tradition in Detroit and is committed to funding, creating and executing the best family events in Michigan. The Parade Company staff, board of directors and thousands of parade volunteers work year-round to bring a wide variety of magnificent events to the City of Detroit and the region including the Ford Fireworks and America’s Thanksgiving Parade® presented by Art Van Furniture. Follow The Parade Company at theparade.org and on Facebook and Twitter.